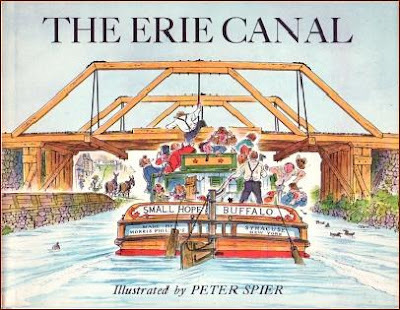 Out of print for many years, Peter Spier’s classic children’s book The Erie Canal, has been republished by Herons Bend Productions of Rochester. Generations of children first learned about the canal through this popular 44-page book. It brings to life the people living and traveling along the Erie Canal with its bright and colorful illustrations. It draws the reader into the illustrations set to the words of the familiar folk song, Fifteen Miles on the Erie Canal or Low Bridge, Everybody Down. This book, since it was first published in 1970, has been shared and enjoyed by young and old alike. It has also reached an untold number of pre-schoolers, elementary school students learning about the history of America and grandchildren singing the familiar folk song. Teachers use this book as a learning tool in the classroom, in teacher workshops. Peter Spier came to New York from Amsterdam, the Netherlands, in 1952. Since that time he has established himself as one of America's most gifted book authors and illustrators. Among the many prestigious awards he has won are the Caldecott Medal, the Caldecott Honor Award, Christopher Award, Boston Globe-Horn Book Award, and the American Book Award. Spier's books have been translated into 26 languages. He and his family reside in Shoreham. Herons Bend Productions is a not-foro-profit organization founded in 2007 by historian Ruth Rosenberg-Naparsteck. Her firm has published several books, including "The Rochester Protectives: One Hundred Years of History," and "The Grand Erie Canal." The 9-by-12-inch book sells for $11.95. For further information call 1-585-750-0421, or go to www.heronsbendproductions.com. 0 Comments to "Erie Canal Children's Book Republished"